Let’s start with the obvious, if you’ve been around the Gazette for a while, you’ve probably caught on that my adult beverages of choice often contain whiskey or bourbon. However, I will often try something else in order to give you a proper review, but also to come into contact with new things. It is this second reason that makes me feel so at home at Nomad Lounge. Here, on the opening page of the menu, they explain, “Our trips are about research, but they are also about understanding cultures, exploring environments, and having unique experiences.” With that mantra in mind, today I offer up two very different cocktails for your consideration, the Annapurna Zing and Jenn’s Tattoo. 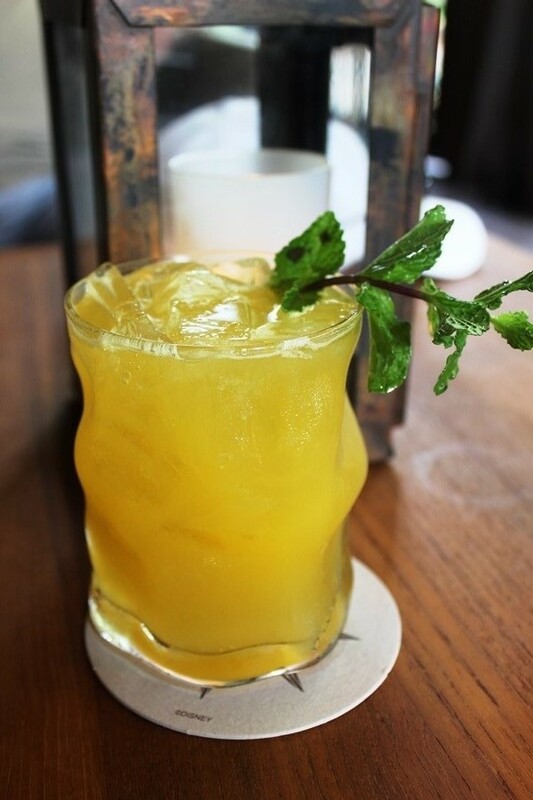 The Annapurna Zing comes from the Indonesia section of the menu and is comprised of Bombay Sapphire East Gin, passion fruit puree, mint, simply syrup, and lime juice, topped with Ginger Beer. While the specific ginger beer isn’t listed, Disney’s fondness for Fever Tree recently makes me think this could be the splash that they are using here. This has a lot of ingredients, but has a very simple flavor. The zing comes from the ginger beer and lime, which are always a good combination, regardless of what spirit you choose to include with them. The simple syrup and passion fruit do their best to minimize, but not entirely mute the zingy elements of the cocktail. If you’re a fan of gin, but you don’t want another martini or gimlet, the Annapurna Zing should be right up your alley. I know I certainly enjoyed mine. 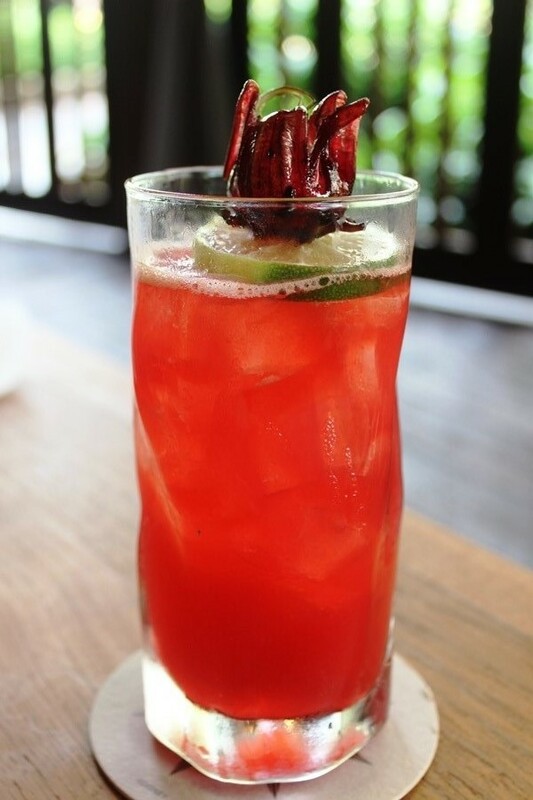 Jenn’s Tattoo is a concoction of Ketel One Vodka, watermelon, hibiscus, and lime juice that comes to us from the Central and South America segment of the menu. The drink comes topped with a lime wheel and a candied flower. I’m going to say this right now, if you do not like sweet cocktails, this is not for you. It is on the opposite side of the spectrum from what I typically enjoy, but the watermelon, hibiscus, and lime juice combination had me intrigued. Unfortunately, the lime and hibiscus were overpowered by the watermelon, which was as sweet as you remember it from your last slice this past summer. It is definitely a dessert in a glass type of drink, but if you want something that is very sweet, and that masks the vodka well, this is the cocktail for you. For me, the best part of the beverage was the candied flower on top, which I thoroughly enjoyed. It may not be the adult beverage of choice for me, but I could see where others would enjoy it. My first visit to Nomad Lounge will in no way, shape, or form be my last visit to this hideaway in Disney’s Animal Kingdom. To paraphrase Nomad Lounge’s travelogue present in the menu, whether you’ve traveled across the world or around the corner, as long as you are doing it for the experience and open to new things, the spirit of travel will remain the same. There is always something new to taste, to widen my world just a bit more, and I’ll keep on exploring menus for all of you, but also for myself!